There are a few trends that are perennially popular come warmer weather; florals, pastels, prints – to name but a few. One of those faves is none other than nautical, when red, white, blue take centre stage with fun accents inspired by the high seas. I’ve rounded up a few navy-themed gift ideas to outfit your home and wardrobe. Women’s Nautical Print Scarves – $12 @ Old Navy – Wrap one of these beauties around your neck for an instant dose of sailor style. At this price, you can surely afford to, even if the ocean breeze whisks it away. Nautical Ballet Flat – $59 @ Zara – Prep up any outfit with these adorable striped flats featuring a clear-as-the-ocean mini heel for a little pep in your step. Sand Dollar Salad Plates – $50 for 4 @ Pottery Barn – Backyard BBQs feel a whole lot more festive when you’ve got some seaside inspiration at your table. Perfect for a Dungeness crab salad if I do say so myself. Chambray Nautical Rope Print Shirt – $92.50 @ J Crew – Whether he’s a landlubber or a seasoned skipper, he’ll look smashing in this lightweight summery shirt. Elisa Cachero Odyssey Shower Curtain – $64 @ Urban Oufitters – Nautical gets a face lift in its most common home application: the bathroom. Go for an all out vintage mythology theme to really set this piece off. Mark / Giusti Beach Bag – $750 @ AHAlife – Pricy sure. But can’t you imagine sunning yourself after a day of shopping in Italy with this slung over your shoulder? Port Story Dress $89.99 @ ModCloth – Expect to see stripes ahoy when you go shopping this season. Want to get ahead of the trend? This adorable dress features an oh-so-summery criss cross back and cute golden buttons to give you just a hint of sailor savvy. Speaking of inspired by the sea, how about a bonus entry into my Nova Scotia-based artisan Jac-Out-Of-The-Box Jewelry giveaway? 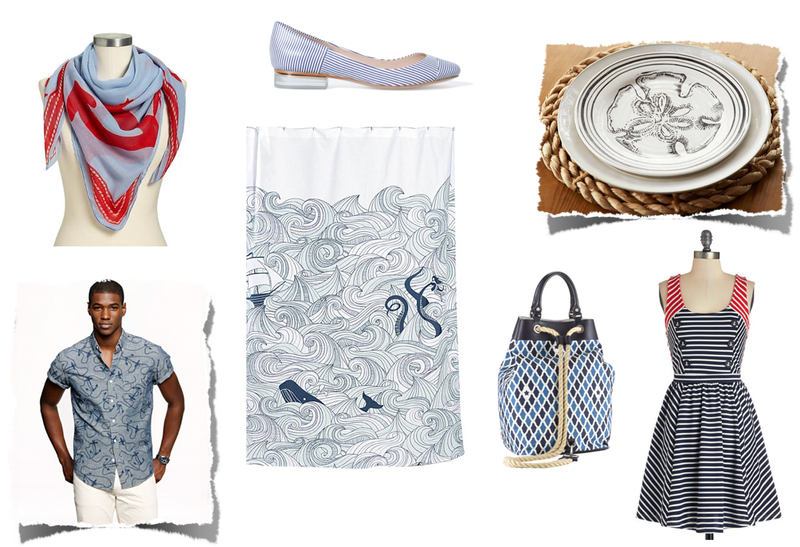 Tell me below – which of these seaside inspired items would you most love to own or gift? The Nautical Ballet Flats look so comfortable. The nautical print scarf from Old Navy is cute. I’d choose it. Love the Port Story Dress $89.99 @ ModCloth ! Awesome!!! I would love that dress by ModCloth! I like the sand dollar salad plates. I love that shower curtain! I have an ocean themed bathroom so it would fit right in! I would love to own the Mark / Giusti Beach Bag! I would like to own he Nautical Ballet Flats from Zara. I would love to own the Nautical Ballet Flats.